Small businesses, churches, not-for-profits, home offices, etc., are required--by law--to contract with a waste collector to provide recycling services (cardboard, paper, containers, document shredding, etc.). The Monroe County ecopark may be used for recyclables managment by Monroe County households only. The ecopark's household hazardous waste (HHW) collection program is free for Monroe County households with home-use chemicals (paints, pesticides, auto-care products, etc.) by appointment only. Click here for details. Households located outside Monroe County may use the ecopark's HHW program for a fee. Simply download, complete and return an out-of-county form (pdf) / (excel format) listing the materials intended for disposal. County staff will review the form, provide a cost estimate and schedule an appointment for the service. 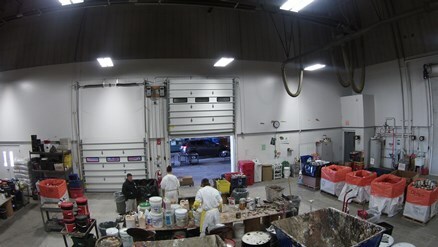 Monroe County households that have somehow acquired industrial-use paints/chemicals may properly dispose of these materials for a fee by using the above-linked form and process. Generates less than 1 kg/month (2.2 pounds) of acute Hazardous Waste (as defined by 6 NYCRR Part 371); and never stores more than this amount on site at any time. Generates less than 100 kg/month (220 pounds) of listed and/or characteristic hazardous waste (as defined by 6 NYCRR Part 371); and never stores more than 1,000 kg/month (2,200 pounds). The interested business fills out a CESQG Form and forwards the information to the county’s Industrial Waste Section. The form includes business type, company name, contact name, and identification of waste type and quantity. The county ensures the business is qualified and calculates an estimated disposal fee (generally, a lower price than a business would receive from a private hazardous waste contractor). An appointment is arranged for the business to deliver the material (self-transport is an additional cost savings to the small business). For more information on this program, call 585 753-7357.